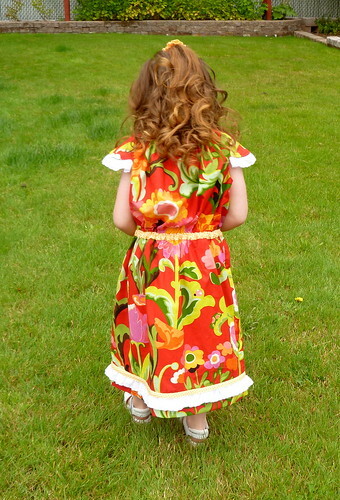 Welcome to Week 33 of the One Yard Wonders Sew Along! 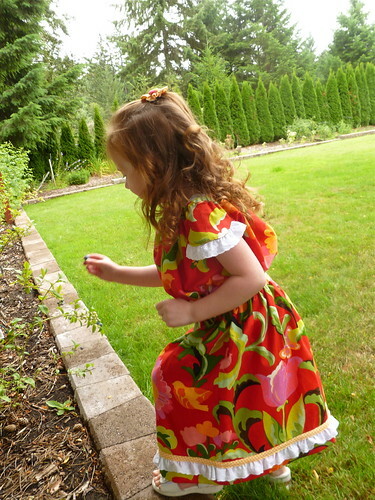 Janis selected Keiki Oops A Daisy Silly Nilly Red and Keiki Oops A Daisy Gingham Yellow. The pattern worked well following step by step. The dress looks huge until the elastic is in, then suddenly it looks like it will fit. Janis made the size 5T. It is plenty long at the waist and hem even after cutting off 1 1/2 inches and using a 2.5 inch hem. Full length the dress could easily fit up to a child size 8. For the 5T, the directions state to place the belt casing 5 1/2 inches below the arm holes. Next time she will place the casing 4 inches below the armholes for a 5T. While Janis enjoys some hand stitching, she machine stitched the armholes instead of the suggested hand stitched finish. Upon completion, she felt it would look better hand stitched. She redid it with the suggested hand stitching. Easing in the fullness was much easier with the hand stitching. Janis used eyelet lace from her stash. The belt casing is made from the coordinating “yellow” gingham from the Keiki Oops A Daisy. The extra gingham made a fun trim above the eyelet on the skirt. Jacqui chose Cary Phillips Floral Folio Large Toss Aqua. Jacqui made a size 4T. The little girl she made this for is tall for her age. Adding length would be easy. The skirt is constructed with rectangles. After Jacqui made the pleats on the front and back skirt pieces she checked them to make sure each piece measured exactly half of the waistband piece. She cut the waistband 25 1/2 inches wide so each skirt piece had to be 12 3/4 inches in width. In step 5, Jacqui divided and marked both the waistband and skirt in quarters. This helped her pin both pieces together evenly. 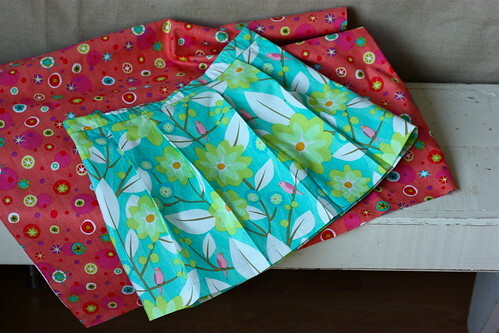 She placed the center seam of the waistband in the center back of the skirt. In step 6, the pattern calls for hand stitching the casing closed. 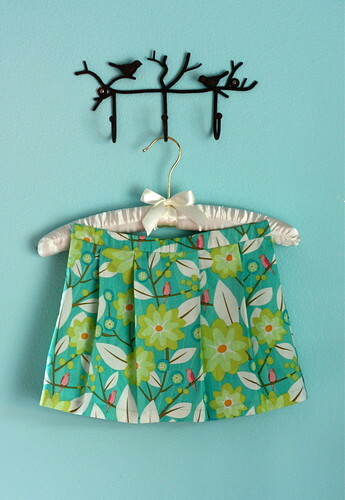 Jacqui was concerned with the durability of her hand stitching since this skirt is going to a very active little girl. 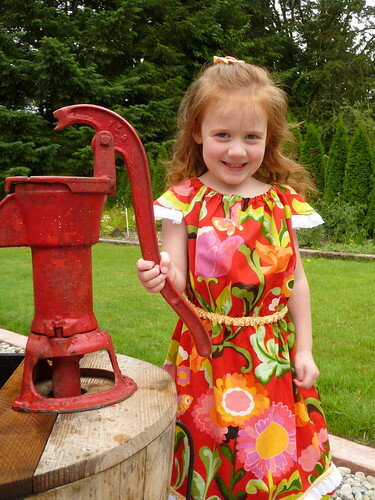 She stitched the casing down by machine, with a “stitch in the ditch” method where the waistband met the skirt.